Makeup: Part edgy, part sweet. Sharp, well defined eyes. Soft mauve lips. Contoured features highlighting the high points of the face. I'm using all Motives Cosmetics. Hair: Sleek, straight, and super long. I'm wearing: Luxury for Princess Princess Super Deluxe Hair clip-in extensions in Chocolate Brown -- these Remy human hair extensions offer volume (220 grams) and length (22 inches), are easy to style and come in ten multi-faceted shades to guarantee a match. NAILS: Saw these nails completed using ImPRESS at the Katie Gallagher Fashion Week showcase and had to recreate them. The original idea was envision by key manicurist Casey Herman for Kiss. I used two different ImPRESS press-ons in medium length for the base nails (pale pink and black) and cut up two more color sets (gunmetal gray and shimmery pink) to create the diamond shapes and layer them for a gothic-girly feel. How's that for Gaga nails?! Apply Motives Eye Shadow Base all over the eye. Using a flat shadow brush, apply Heiress eyeshadow to the movable part of the lid and past the crease. Using Onyx eyeshadow on an angle liner brush or brow brush, carve out the crease following your eye socket shape. This is a great trick for enlarging Asian eyes. Line the lower lash line and extend the outer crease edge. Blend out the harsh edge of Onyx with Cappuccino eyeshadow on a pointed crease brush. Apply Vanilla eyeshadow to the brow bone. Line the top lash line using Motives Liquid liner in Noir extending the outer wing. Add lash extensions to the bottom of the lash line. Add Motives Glitter Liner in Starry Eyes on top of the lash extensions and the inner portion of the liner. 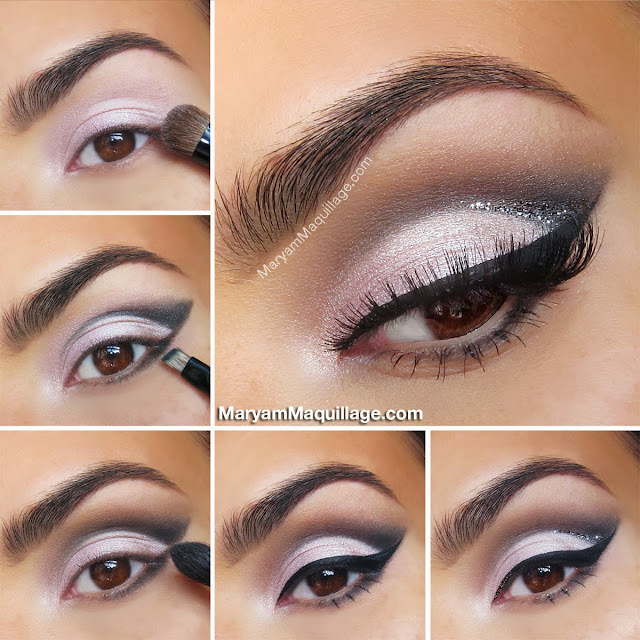 Add a line of glitter to the outer half of the crease. Apply lashes and mascara. My lashes: Ardell Double Up 202 from HB Beauty Bar. Special Thanks to my Mr. Maquillage! Gorgeous. You are so talented. I like it when your hair is that straight, looks different and beautiful as always. The glitter in the crease is such an eyecatcher! This is SO beautiful, I love the glitter detail too. I wish I had your skills! One of my most favorite looks every wowwwww this is soo gorgeous honey you look amaze balls!!! Awesome nails and great eye makeup!! That is a great idea to add a bit of glitter just in the outer crease. Stunning & Sensational as always ! I love how you've made this edgy makeup completely wearable! Stunning.